[MARCH 7, 2003] Welcome to the Teen Scene. This page is dedicated to the youth of our community. We hope it is a place that will serve to inform, entertain and reflect the opinions of our local teens in Lincoln and all Logan County. This page, like all of LDN, will be reader-directed. What is of interest to you will be what is of interest to us to post. We want your input about what you want to see here. We want you to participate by telling us about yourselves, what you like to do, what your opinions are on current events or local issues, the ups and downs of living here in rural America, as well as your personal perspectives on home and school life. Working together, we think this space should be a resource and a reflection of teen life in Logan County. [MARCH 7, 2003] URBANA -- Students on 11 Midwestern college and university campuses are participating in a study on credit use that may lead to greater understanding of problems stemming from overuse of charge cards and how to prevent those problems. "We'll use the information we are gathering to develop an educational program for college students called $tudent $marts," explained Angela C. Lyons, a University of Illinois assistant professor of consumer and family economics in the Department of Agricultural and Consumer Economics. Last fall, Lyons completed a study of credit card use on the U of I's Urbana-Champaign campus. "The problem of students running up large debts from credit card use has been a hot button for the last couple of years, but with the economy's direction in the past six months it has become even hotter. I first became interested after hearing media reports about students who committed suicide over credit card debt." Although the 11-campus study is still a month or two from completion, Lyons says early indications bring a bit of good news. "The majority of students on Midwestern campuses appear to be using credit cards responsibly," she said. "They are not getting themselves into high-risk credit situations. However, there is a minority that is having problems. And a cause for concern is the fact that this minority appears to be increasing at a dramatic rate." Students experiencing financial problems from credit card use tend to fall into two categories. "There is one group that is simply financially irresponsible," she says. "I suspect that group will always remain. Yet, we also find a growing group of students who use credit cards to cover school expenses -- tuition, fees, and textbooks. It appears that the financial aid packages available to them are not enough to cover the costs of college." Of the 38,000-plus students who have responded to Lyons' survey, almost 36 percent indicated they were using credit cards to pay education costs because they had no other source. "That really concerns me because we may be heading toward a situation where low-income students are no longer able to afford college," she said. Four warning signs indicate a student is having credit card problems. "If the annual monthly balance is $1,000 or more is the first indicator," Lyons said. "Another warning sign is chronic delinquency in making payments. Maxing out credit cards is another. Finally, if the student is frequently unable to pay their balances in full each month, that usually means there is a problem." Students who fall into these categories, she added, tend to be from socio-economically disadvantaged groups -- groups that traditionally have had limited access to credit. "If we meet the needs of these students, we meet the needs of all students," Lyons said. $tudent $marts is the educational program Lyons is developing to help those students and, in many cases, their parents. "Parents can benefit by learning the warning signs and monitoring their children's use of credit cards," she said. "Sometimes, parents perpetuate the problem by simply paying off the large balances, which can encourage the students to continue poor credit management habits." Unlike many problems, student credit card abuse is one that does not suffer from a lack of information. In fact, she noted, there is a surplus of information, and it is difficult to know what information is good and what is bad. "One of the goals of the project is to develop a resource center of good information," she said. "We also intend to develop a training program that would allow campuses to send people for training who could then return to their campuses and incorporate the information. "We want to develop flexibility in the program, too. All campuses are different, and students sometimes have different ways in which they prefer to get information. Some campuses might want to make this training part of freshman orientation; others might want to include it in a class; others might want to offer it through the financial aid office." Funding for the study has come from the Department of Agricultural and Consumer Economics and the U of I Moms and Dads associations. Participating campuses are U of I-Urbana-Champaign, U of I-Chicago, U of I-Springfield, Bradley University, Illinois State University, Northern Illinois University, Southern Illinois University-Carbondale, Western Illinois University, Purdue University, the University of Wisconsin-Madison and the University of Missouri-Columbia. [MARCH 7, 2003] University of Illinois Extension invites anyone 15-18 years old from Logan, Tazewell, Peoria, Woodford, Mason and Fulton counties to join them for the "Current River Float Challenge" from July 11 to 13. Those who take the challenge will have their choice of canoes or tubes to experience the Current River in Eminence, Mo. Participants will be grouped into tribes, which will be rewarded during the survival ceremony at the end of the trip. They will also have the opportunity to camp, swim, float, have fun and meet new friends. Space is limited. Cost for the trip is $140 per person. Half of the fee is required by April 1. To register or receive further information, call (309) 547-3711. U of I Extension provides out-of-the-classroom educational opportunities that help people deal with the critical issues impacting their daily lives. We think that there is no challenge more important than preparing our young people for the world they will inherit. U of I Extension meets this challenge in a fun, action-oriented and practical manner. the return of the "Hallway Buzz"
Next week's question: What do you do with your free time? Registration from noon to 1 p.m.
[MARCH 7, 2003] The results are out! In October 2002, Lincoln Daily News and Logan-Mason Mental Health conducted an online community needs assessment. The findings below are taken from that survey. 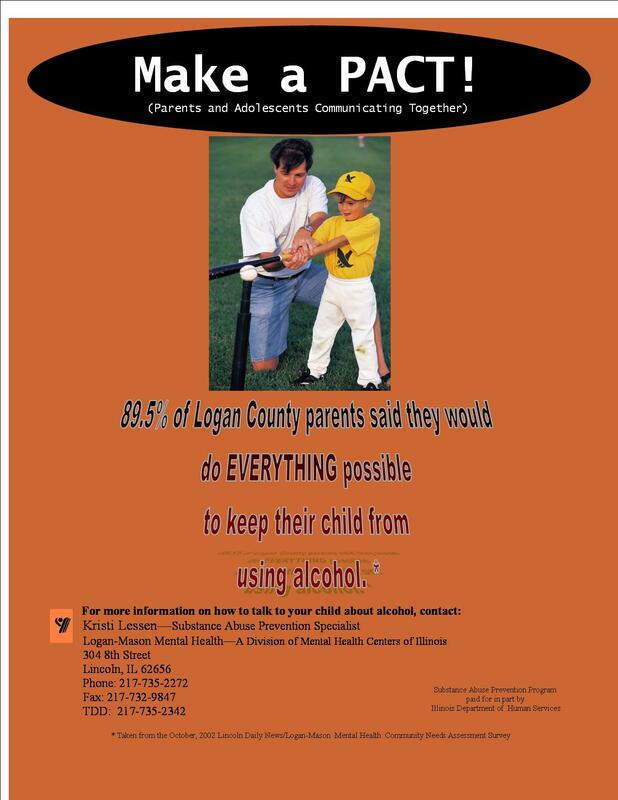 89.5 percent of Logan County parents said they would do EVERYTHING possible to keep their child from using alcohol. 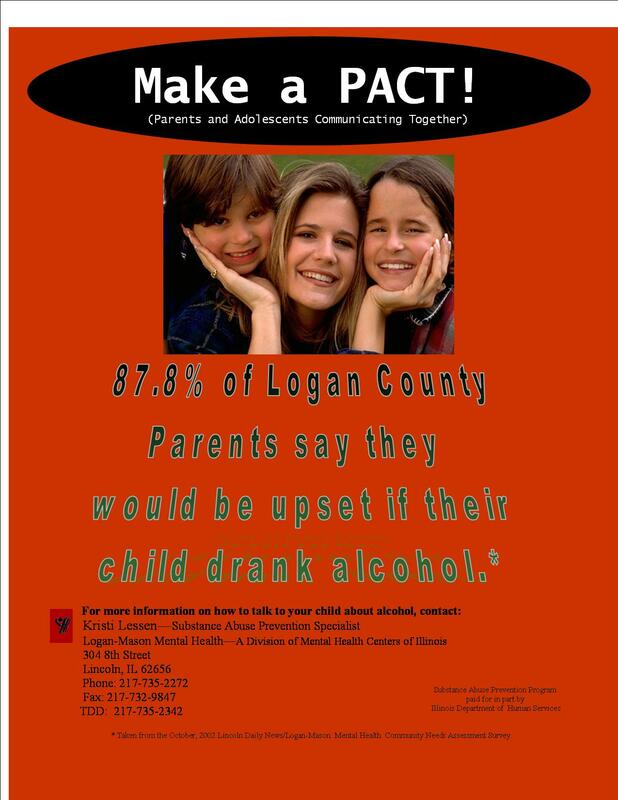 87.8 percent of Logan County parents say they would be upset if their child drank alcohol. 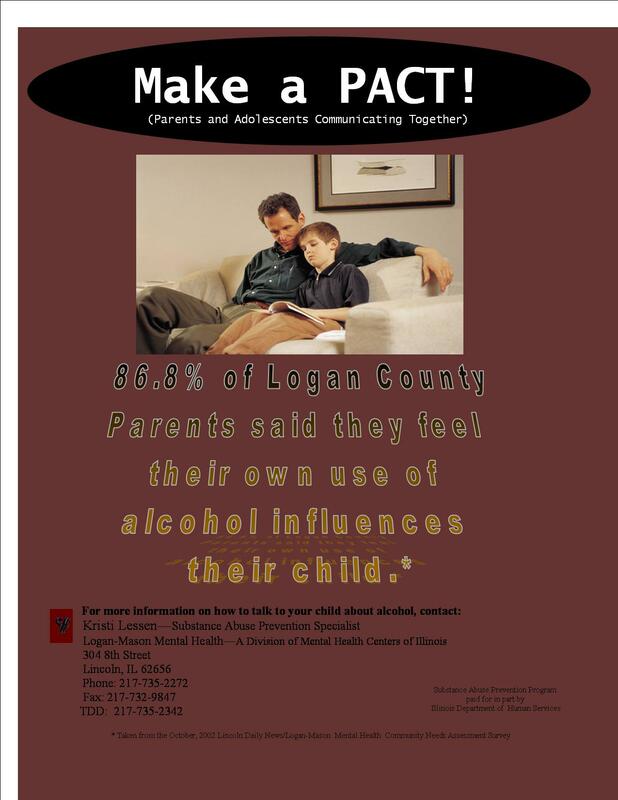 86.8 percent of Logan County parents said they feel their own use of alcohol influences their child. 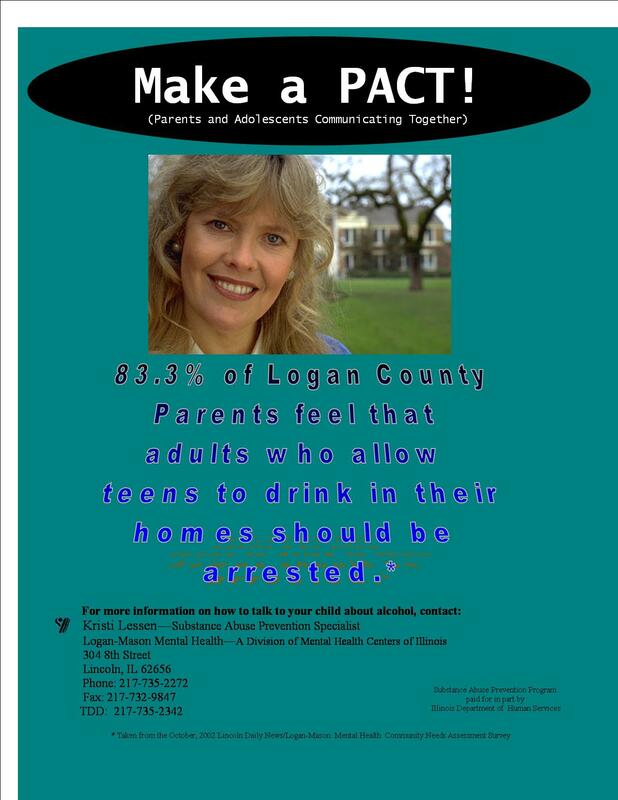 83.3 percent of Logan County parents feel that adults who allow teens to drink in their homes should be arrested. 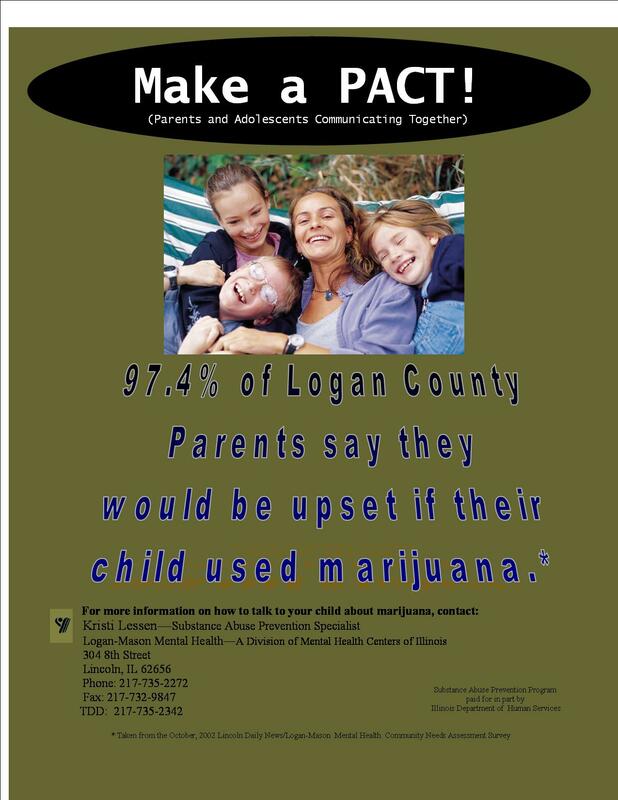 97.4 percent of Logan County parents say they would be upset if their child used marijuana. 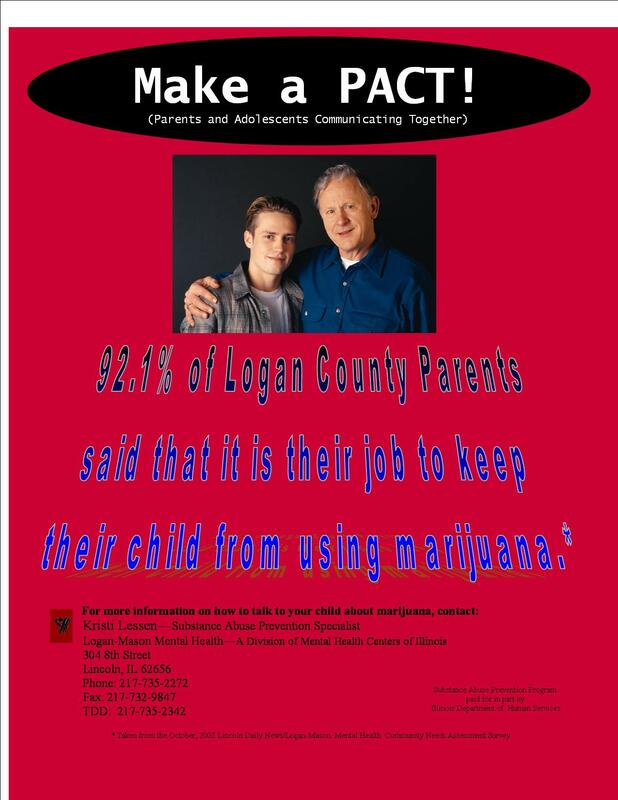 92.1 percent of Logan County parents say that it is their job to keep their child from using marijuana. 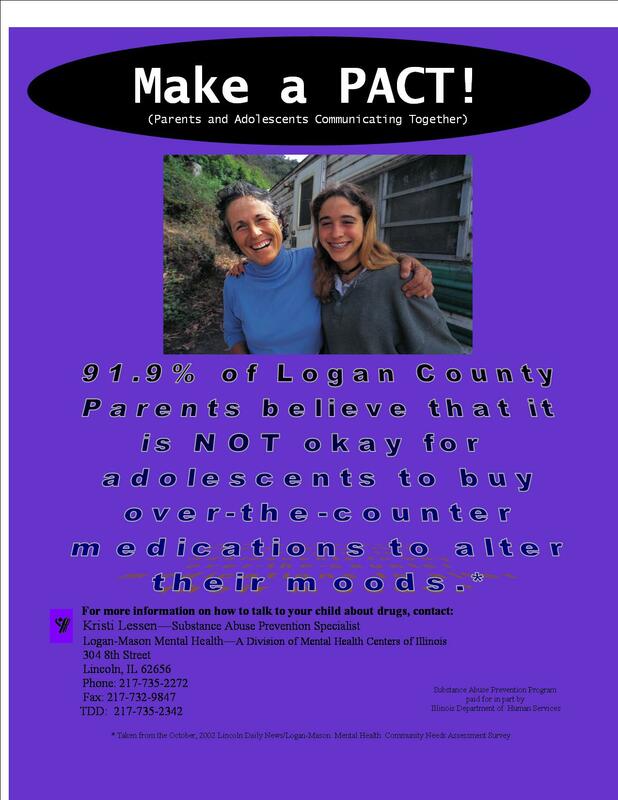 91.9 percent of Logan County parents believe that it is NOT OK for adolescents to buy over-the-counter drugs to alter their moods. If you are interested in getting a copy or copies of the statistics, you may contact Kristi Lessen, substance abuse prevention specialist, Logan-Mason Mental Health, a division of Mental Health Centers of Illinois, 304 Eighth St., Lincoln, IL 62656; phone (217) 735-2272; fax (217) 732-9847; lessen.kristin@mhsil.com.